It’s a rainy Saturday over the Canada Day weekend. 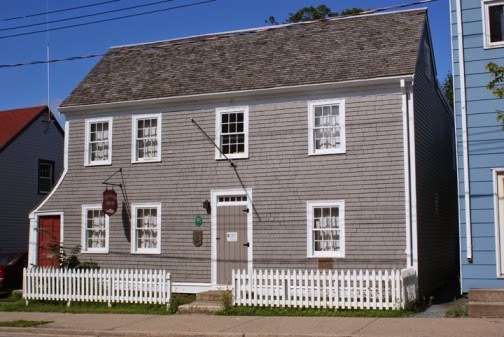 I am on my way to the Quaker House in downtown Dartmouth to discover more about this special place that is steeped in hundreds of years of history. From the 17th century cemetery that juts out on top of a hill off of Victoria Street, to Christ Church on Dundas street with its identifiable weather vane atop the steeple (which represents Haley's Comet). I have been meaning to get to the Quaker House since I moved here. 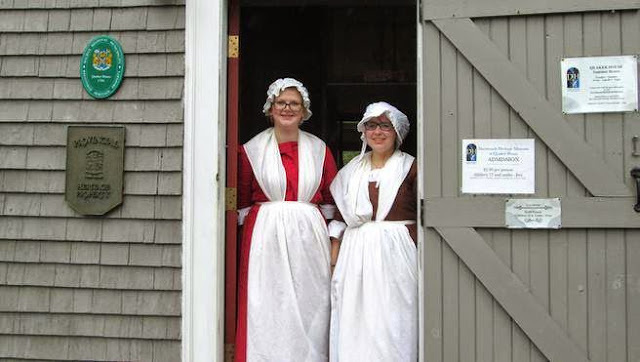 When I arrive, I am greeted by two jovial young women dressed in traditional Quaker attire. They are excited to tell me about the history of this place. A tour of the house and the stories along the way help to enlighten me. Originating in England and founded by George Fox, the fundamental Quaker principle is that God is in each and everyone of us (“divine harmony”), and as such all men, women and children have the right to speak (very progressive for a time when women were not allowed to speak in church). As I tour the small home from room to room, I notice silhouette prints through out rather than actual photos. I am told that part of being a Quaker is a strong sense of modesty, with no overt displays of vanity or inequality. Photos would have represented vanity, so black and white silhouettes took their place. This caused a bit of difficulty for the museum to replicate costumes when trying to depict the clothing attire leaning towards simplicity. The home is dark and you can gather that it would have been cold in the damp winter months. The women would weave wool into yarn for hours on end, for use in creating clothing and blankets. The wool came from the sheep on the Dartmouth Common, where the community’s livestock grazed freely. The women would also spend a lot of time in the kitchen staying warm and cooking. The men were often away for up to four years at a time, out whaling in the Atlantic (primarily for sperm whales which were valued for their oil). A fabulous display of whaling artifacts are on display, such as a whale’s skull, artworks created by the sailors and drawings of the various tools and techniques the hunters used. Dartmouth had established quite a name for itself during this time (1786 to 1788). Half of the whaling ships that entered London's harbor were from here; the oil they carried lighting up the streets of London and causing many in England to envy the success of the Dartmouth whalers. Eventually though, many of the Dartmouth Quaker leaders such as Samuel Starbuck and Timothy Folger (yes of Folgers coffee fame) left, setting sail for Wales with their families in tow to establish the whaling colony and town of Milford Haven. William Ray stayed on for a bit longer, but eventually he returned with his family to his birthplace of Nantucket, and the Dartmouth whaling industry faded into memory. We are left with this incredible piece of history that can be enjoyed by all. These stories and many more line the walls of this home and the downtown streets of Dartmouth. This summer make sure to stop by the Quaker House and listen to the tales of long ago, have the kids partake in arts and crafts on Saturdays, from 11 am to 12 pm (shipbuilding, whale building and much more). Admission is $2, and donations are always welcome.